This versatile spa can be used on your patio, basement, sunroom, backyard etc , and the built-in hard water treatment system makes water gentler on skin for a soothing experience ; Tips: To accelerate heating the water you can seal the cover and pour some hot water in and Recommended to clean after each usage and replace after 7-10 days of use the filter cartridges. Always dreamed of having your very own hot tub? The Homax Inflatable Hot Tub is the affordable, go-anywhere spa which can comfortably accommodate up to 6 adults! 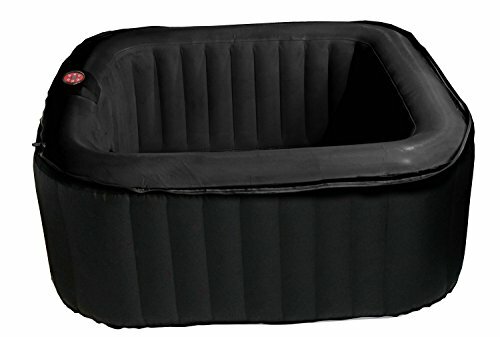 This fully portable, inflatable hot tub can be easily set up either indoors or outdoors within minutes. The Homax requires no tools or professional installation. With its soothing 104 Degree F water temperature and massage jets, the Homax Hot Tub is perfect for soaking sore muscles, unwinding after a hard day at work or even as a luxurious and romantic treat for you and your partner to enjoy together. The digital control panel allows you to turn up the heat without having to exit the tub.